The age of fast, accurate, and noninvasive cancer screening is rapidly becoming reality. The power of next-generation sequencing has allowed molecular diagnostic techniques to sample small amounts of blood for the genetic hallmarks of tumorigenesis. These liquid biopsy procedures, as they have been dubbed, typically search for circulating tumor DNA (ctDNA) that has made its way into the systemic circulation from tumor cells that have died or enrich for circulating tumor cells (CTCs) that have broken off from the primary cancer site. Now, a team of researchers lead by scientists at Massachusetts General Hospital (MGH), have developed a new diagnostic test that analyzes the tumor RNA picked up in circulating platelets. The investigators believe this new method could become even more useful than other molecular technologies for diagnosing cancer since it can also determine the primary location of the tumor and provide insight to potential therapeutic approaches. “By combining next-generation-sequencing gene expression profiles of platelet RNA with computational algorithms we developed, we were able to detect the presence of cancer with 96 percent accuracy,” explains co-senior author Bakhos Tannous, Ph.D., associate professor Harvard Medical School and associate neuroscientist at MGH. “Platelet RNA signatures also provide valuable information on the type of tumor present in the body and can guide the selection of the most optimal treatment for individual patients. In the current study the research team describes finding that the RNA profiles of tumor-educated platelets (TEPs)—those that have taken up molecules shed by tumors—can distinguish among blood samples of healthy individuals and those of patients with six types of cancer, determine the location of the primary tumor, and identify tumors carrying mutations that can guide therapeutic decision-making. Over the past several years, the scientific literature has shown that in addition to their role in promoting blood clotting, platelets take up protein and RNA molecules from tumors, possibly playing a role in tumor growth and metastasis. Dr. Tannous and his colleagues set out to determine whether tumor RNA carried in platelets could be used to diagnose and classify common types of cancer. The investigators isolated platelets from blood samples taken from 55 healthy donors, 39 individual with early-stage cancer and 189 patients with advanced, metastatic cancer. Among those patients with cancer, they were diagnosed with non-small-cell lung cancer, colorectal cancer, glioblastoma, pancreatic cancer, hepatobiliary cancer, or breast cancer. The comparison of RNA profiles from the healthy donors to those of the cancer patients identified increased levels of approximately 1,500 RNA molecules—many involved in cancer-associated processes—and a reduction of almost 800 in samples from cancer patients. Using their novel algorithm, the MGH group was able to examine close to 1,000 RNAs from almost 300 individuals with 96% accuracy for the presence of cancer. Additionally, the platelet mRNA profiles were able to identify the particular type of cancer within each patient participant, including distinguishing among three types of gastrointestinal adenocarcinoma: colorectal cancer, pancreatic cancer, and hepatobiliary cancer. Platelets from patients with tumors driven by mutations in KRAS or EGFR proteins—biomarkers that can guide the use of drugs targeting those mutations—proved to have unique RNA profiles as well. The researchers were excited by their findings and emphasize the uniqueness of their approach as currently utilized liquid biopsy approaches have been unable to diagnose cancer while simultaneously pinpointing the location of the primary tumor. Myron G. Best Nik Sol, Jihane Tannous, Bart A. Westerman, François Rustenburg, Pepijn Schellen, Heleen Verschueren, Edward Post, Jan Koster, Bauke Ylstra, Irsan Kooi, et al. Tumor-educated blood platelets (TEPs) are implicated as central players in the systemic and local responses to tumor growth, thereby altering their RNA profile. We determined the diagnostic potential of TEPs by mRNA sequencing of 283 platelet samples. We distinguished 228 patients with localized and metastasized tumors from 55 healthy individuals with 96% accuracy. Across six different tumor types, the location of the primary tumor was correctly identified with 71% accuracy. Also, MET or HER2-positive, and mutant KRAS, EGFR, orPIK3CA tumors were accurately distinguished using surrogate TEP mRNA profiles. Our results indicate that blood platelets provide a valuable platform for pan-cancer, multiclass cancer, and companion diagnostics, possibly enabling clinical advances in blood-based “liquid biopsies”. Blood-based “liquid biopsies” provide a means for minimally invasive molecular diagnostics, overcoming limitations of tissue acquisition. Early detection of cancer, clinical cancer diagnostics, and companion diagnostics are regarded as important applications of liquid biopsies. 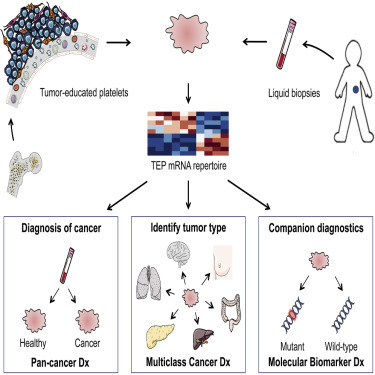 Here, we report that mRNA profiles of tumor-educated blood platelets (TEPs) enable for pan-cancer, multiclass cancer, and companion diagnostics in both localized and metastasized cancer patients. The ability of TEPs to pinpoint the location of the primary tumor advances the use of liquid biopsies for cancer diagnostics. The results of this proof-of-principle study indicate that blood platelets are a potential all-in-one platform for blood-based cancer diagnostics, using the equivalent of one drop of blood. Cancer is primarily diagnosed by clinical presentation, radiology, biochemical tests, and pathological analysis of tumor tissue, increasingly supported by molecular diagnostic tests. Molecular profiling of tumor tissue samples has emerged as a potential cancer classifying method (Akbani et al., 2014, Golub et al., 1999, Han et al., 2014, Hoadley et al., 2014, Kandoth et al., 2013,Ramaswamy et al., 2001, Su et al., 2001). In order to overcome limitations of tissue acquisition, the use of blood-based liquid biopsies has been suggested (Alix-Panabières et al., 2012, Crowley et al., 2013, Haber and Velculescu, 2014). Several blood-based biosources are currently being evaluated as liquid biopsies, including plasma DNA (Bettegowda et al., 2014, Chan et al., 2013, Diehl et al., 2008, Murtaza et al., 2013, Newman et al., 2014, Thierry et al., 2014) and circulating tumor cells (Bidard et al., 2014, Dawson et al., 2013, Maheswaran et al., 2008, Rack et al., 2014). So far, implementation of liquid biopsies for early detection of cancer has been hampered by non-specificity of these biosources to pinpoint the nature of the primary tumor (Alix-Panabières and Pantel, 2014,Bettegowda et al., 2014). It has been reported that tumor-educated platelets (TEPs) may enable blood-based cancer diagnostics (Calverley et al., 2010, McAllister and Weinberg, 2014,Nilsson et al., 2011). Blood platelets—the second most-abundant cell type in peripheral blood—are circulating anucleated cell fragments that originate from megakaryocytes in bone marrow and are traditionally known for their role in hemostasis and initiation of wound healing (George, 2000, Leslie, 2010). More recently, platelets have emerged as central players in the systemic and local responses to tumor growth. Confrontation of platelets with tumor cells via transfer of tumor-associated biomolecules (“education”) is an emerging concept and results in the sequestration of such biomolecules (Klement et al., 2009,Kuznetsov et al., 2012, McAllister and Weinberg, 2014, Nilsson et al., 2011,Quail and Joyce, 2013). Moreover, external stimuli, such as activation of platelet surface receptors and lipopolysaccharide-mediated platelet activation (Denis et al., 2005, Rondina et al., 2011), induce specific splicing of pre-mRNAs in circulating platelets (Power et al., 2009, Rowley et al., 2011, Schubert et al., 2014). Platelets may also undergo queue-specific splice events in response to signals released by cancer cells and the tumor microenvironment—such as stromal and immune cells. The combination of specific splice events in response to external signals and the capacity of platelets to directly ingest (spliced) circulating mRNA can provide TEPs with a highly dynamic mRNA repertoire, with potential applicability to cancer diagnostics (Calverley et al., 2010, Nilsson et al., 2011) (Figure 1A). In this study, we characterize the platelet mRNA profiles of various cancer patients and healthy donors and investigate their potential for TEP-based pan-cancer, multiclass cancer, and companion diagnostics. We prospectively collected and isolated blood platelets from healthy donors (n = 55) and both treated and untreated patients with early, localized (n = 39) or advanced, metastatic cancer (n = 189) diagnosed by clinical presentation and pathological analysis of tumor tissue supported by molecular diagnostics tests. The patient cohort included six tumor types, i.e., non-small cell lung carcinoma (NSCLC, n = 60), colorectal cancer (CRC, n = 41), glioblastoma (GBM, n = 39), pancreatic cancer (PAAD, n = 35), hepatobiliary cancer (HBC, n = 14), and breast cancer (BrCa, n = 39) (Figure 1B; Table 1; Table S1). The cohort of healthy donors covered a wide range of ages (21–64 years old, Table 1). HD, healthy donors; GBM, glioblastoma; NSCLC, non-small cell lung cancer; CRC, colorectal cancer; PAAD, pancreatic cancer; BrCa, breast cancer; HBC, hepatobiliary cancer. See also Table S1. aIndicated are number of male individuals. bIndicated is mean age in years. Platelet purity was confirmed by morphological analysis of randomly selected and freshly isolated platelet samples (contamination is 1 to 5 nucleated cells per 10 million platelets, see Supplemental Experimental Procedures), and platelet RNA was isolated and evaluated for quality and quantity (Figure S1A). A total of 100–500 pg of platelet total RNA (the equivalent of purified platelets in less than one drop of blood) was used for SMARTer mRNA amplification and sequencing (Ramsköld et al., 2012) (Figures 1C and S1A). Platelet RNA sequencing yielded a mean read count of ∼22 million reads per sample. After selection of intron-spanning (spliced) RNA reads and exclusion of genes with low coverage (seeSupplemental Experimental Procedures), we detected in platelets of healthy donors (n = 55) and localized and metastasized cancer patients (n = 228) 5,003 different protein coding and non-coding RNAs that were used for subsequent analyses. The obtained platelet RNA profiles correlated with previously reported mRNA profiles of platelets (Bray et al., 2013, Kissopoulou et al., 2013, Rowley et al., 2011, Simon et al., 2014) and megakaryocytes (Chen et al., 2014) and not with various non-related blood cell mRNA profiles (Hrdlickova et al., 2014) (Figure S1B). Furthermore, DAVID Gene Ontology (GO) analysis revealed that the detected RNAs are strongly enriched for transcripts associated with blood platelets (false discovery rate [FDR] < 10−126). Among the 5,003 RNAs, we identified known platelet markers, such as B2M, PPBP, TMSB4X, PF4, and several long non-coding RNAs (e.g., MALAT1). A total of 1,453 out of 5,003 mRNAs were increased and 793 out of 5,003 mRNAs were decreased in TEPs as compared to platelet samples of healthy donors (FDR < 0.001), while presenting a strong correlation between these platelet mRNA profiles (r = 0.90, Pearson correlation) (Figure 1D). Unsupervised hierarchical clustering based on the differentially detected platelet mRNAs distinguished two sample groups with minor overlap (Figure 1E; Table S2). DAVID GO analysis revealed that the increased TEP mRNAs were enriched for biological processes such as vesicle-mediated transport and the cytoskeletal protein binding while decreased mRNAs were strongly involved in RNA processing and splicing (Table S3). A correlative analysis of gene set enrichment (CAGE) GO methodology, in which 3,875 curated gene sets of the GSEA database were correlated to TEP profiles (see Experimental Procedures), demonstrated significant correlation of TEP mRNA profiles with cancer tissue signatures, histone deacetylases regulation, and platelets (Table 2). The levels of 20 non-protein coding RNAs were altered in TEPs as compared to platelets from healthy individuals and these show a tumor type-associated RNA profile (Figure S1C). (A) Schematic overview of tumor-educated platelets (TEPs) as biosource for liquid biopsies. (B) Number of platelet samples of healthy donors and patients with different types of cancer. (C) TEP mRNA sequencing (mRNA-seq) workflow, as starting from 6 ml EDTA-coated tubes, to platelet isolation, mRNA amplification, and sequencing. (D) Correlation plot of mRNAs detected in healthy donor (HD) platelets and cancer patients’ TEPs, including highlighted increased (red) and decreased (blue) TEP mRNAs. (E) Heatmap of unsupervised clustering of platelet mRNA profiles of healthy donors (red) and patients with cancer (gray). (F) Cross-table of pan-cancer SVM/LOOCV diagnostics of healthy donor subjects and patients with cancer in training cohort (n = 175). Indicated are sample numbers and detection rates in percentages. (G) Performance of pan-cancer SVM algorithm in validation cohort (n = 108). Indicated are sample numbers and detection rates in percentages. (H) ROC-curve of SVM diagnostics of training (red), validation (blue) cohort, and random classifiers, indicating the classification accuracies obtained by chance of the training and validation cohort (gray). (I) Total accuracy ratios of SVM classification in five subgroups, including corresponding predictive strengths. Genes, number of mRNAs included in training of the SVM algorithm. See also Figure S1 and Tables S1, S2, S3, and S4. Top-ranking correlations of platelet-mRNA profiles with 3,875 Broad Institute curated gene sets. CAGE, Correlative Analysis of Gene Set Enrichment; GO, gene ontology; #, number of hits per annotation; IL, interleukin; HDAC, histone deacetylase. aIndicated are lowest and highest correlations per annotation. Next, we determined the diagnostic accuracy of TEP-based pan-cancer classification in the training cohort (n = 175), employing a leave-one-out cross-validation support vector machine algorithm (SVM/LOOCV, see Experimental Procedures; Figures S1D and S1E), previously used to classify primary and metastatic tumor tissues (Ramaswamy et al., 2001, Su et al., 2001, Vapnik, 1998, Yeang et al., 2001). Briefly, the SVM algorithm (blindly) classifies each individual sample as cancer or healthy by comparison to all other samples (175 − 1) and was performed 175 times to classify and cross validate all individuals samples. The algorithms we developed use a limited number of different spliced RNAs for sample classification. To determine the specific input gene lists for the classifying algorithms we performed ANOVA testing for differences (as implemented in the R-package edgeR), yielding classifier-specific gene lists (Table S4). For the specific algorithm of the pan-cancer TEP-based classifier test we selected 1,072 RNAs (Table S4) for the n = 175 training cohort, yielding a sensitivity of 96%, a specificity of 92%, and an accuracy of 95% (Figure 1F). Subsequent validation using a separate validation cohort (n = 108), not involved in input gene list selection and training of the algorithm, yielded a sensitivity of 97%, a specificity of 94%, and an accuracy of 96% (Figure 1G), with an area under the curve (AUC) of 0.986 to detect cancer (Figure 1H) and high predictive strength (Figure 1I). In contrast, random classifiers, as determined by multiple rounds of randomly shuffling class labels (permutation) during the SVM training process (see Experimental Procedures), had no predictive power (mean overall accuracy: 78%, SD ± 0.3%, p < 0.01), thereby showing, albeit an unbalanced representation of both groups in the study cohort, specificity of our procedure. A total of 100 times random class-proportional subsampling of the entire dataset in a training and validation set (ratio 60:40) yielded similar accuracy rates (mean overall accuracy: 96%, SD: ± 2%), confirming reproducible classification accuracy in this dataset. Of note, all 39 patients with localized tumors and 33 of the 39 patients with primary tumors in the CNS were correctly classified as cancer patients (Figure 1I). Visualization of 22 genes previously identified at differential RNA levels in platelets of patients with various non-cancerous diseases (Gnatenko et al., 2010, Healy et al., 2006, Lood et al., 2010,Raghavachari et al., 2007), revealed mixed levels in our TEP dataset (Figure S1F), suggesting that the platelet RNA repertoire in patients with non-cancerous disease is distinct from patients with cancer. In addition to the pan-cancer diagnosis, the TEP mRNA profiles also distinguished healthy donors and patients with specific types of cancer, as demonstrated by the unsupervised hierarchical clustering of differential platelet mRNA levels of healthy donors and all six individual tumor types, i.e., NSCLC, CRC, GBM, PAAD, BrCa, and HBC (Figures 2A, all p < 0.0001, Fisher’s exact test, and S2A; Table S5), and this resulted in tumor-specific gene lists that were used as input for training and validation of the tumor-specific algorithms (Table S4). For the unsupervised clustering of the all-female group of BrCa patients, male healthy donors were excluded to avoid sample bias due to gender-specific platelet mRNA profiles (Figure S2B). SVM-based classification of all individual tumor classes with healthy donors resulted in clear distinction of both groups in both the training and validation cohort, with high sensitivity and specificity, and 38/39 (97%) cancer patients with localized disease were classified correctly (Figures 2B and S2C). CAGE GO analysis showed that biological processes differed between TEPs of individual tumor types, suggestive of tumor-specific “educational” programs (Table S6). We did not detect sufficient differences in mRNA levels to discriminate patients with non-metastasized from patients with metastasized tumors, suggesting that the altered platelet profile is predominantly influenced by the molecular tumor type and, to a lesser extent, by tumor progression and metastases. We next determined whether we could discriminate three different types of adenocarcinomas in the gastro-intestinal tract by analysis of the TEP-profiles, i.e., CRC, PAAD, and HBC. We developed a CRC/PAAD/HBC algorithm that correctly classified the mixed TEP samples (n = 90) with an overall accuracy of 76% (mean overall accuracy random classifiers: 42%, SD: ± 5%, p < 0.01,Figure 2C). In order to determine whether the TEP mRNA profiles allowed for multiclass cancer diagnosis across all tumor types and healthy donors, we extended the SVM/LOOCV classification test using a combination of algorithms that classified each individual sample of the training cohort (n = 175) as healthy donor or one of six tumor types (Figures S2D and S2E). The results of the multiclass cancer diagnostics test resulted in an average accuracy of 71% (mean overall accuracy random classifiers: 19%, SD: ± 2%, p < 0.01,Figure 2D), demonstrating significant multiclass cancer discriminative power in the platelet mRNA profiles. The classification capacity of the multiclass SVM-based classifier was confirmed in the validation cohort of 108 samples, with an overall accuracy of 71% (Figure 2E). An overall accuracy of 71% might not be sufficient for introduction into cancer diagnostics. However, of the initially misclassified samples according to the SVM algorithms choice with strongest classification strength the second ranked classification was correct in 60% of the cases. This yields an overall accuracy using the combined first and second ranked classifications of 89%. The low validation score of HBC samples can be attributed to the relative low number of samples and possibly to the heterogenic nature of this group of cancers (hepatocellular cancers and cholangiocarcinomas). 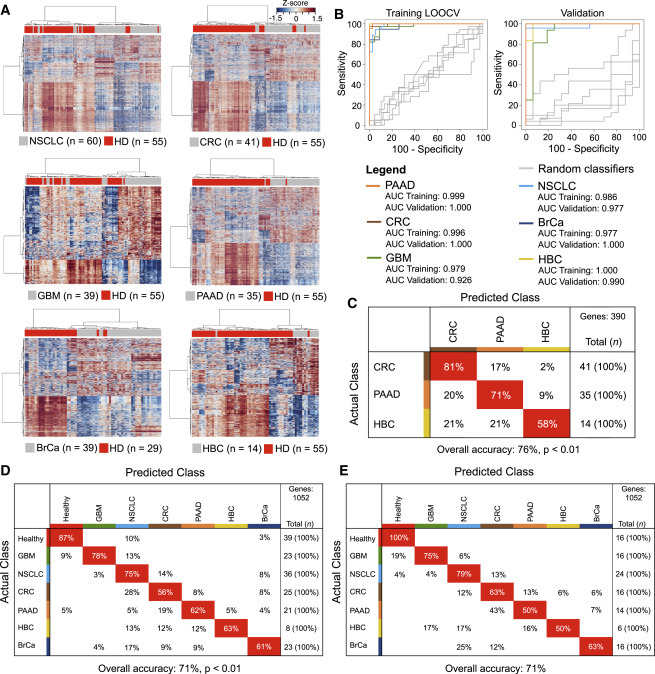 (A) Heatmaps of unsupervised clustering of platelet mRNA profiles of healthy donors (HD; n = 55) (red) and patients with non-small cell lung cancer (NSCLC; n = 60), colorectal cancer (CRC; n = 41), glioblastoma (GBM; n = 39), pancreatic cancer (PAAD, n = 35), breast cancer (BrCa; n = 39; female HD; n = 29), and hepatobiliary cancer (HBC; n = 14). (B) ROC-curve of SVM diagnostics of healthy donors and individual tumor classes in both training (left) and validation (right) cohort. Random classifiers, indicating the classification accuracies obtained by chance, are shown in gray. (C) Confusion matrix of multiclass SVM/LOOCV diagnostics of patients with CRC, PAAD, and HBC. Indicated are detection rates as compared to the actual classes in percentages. 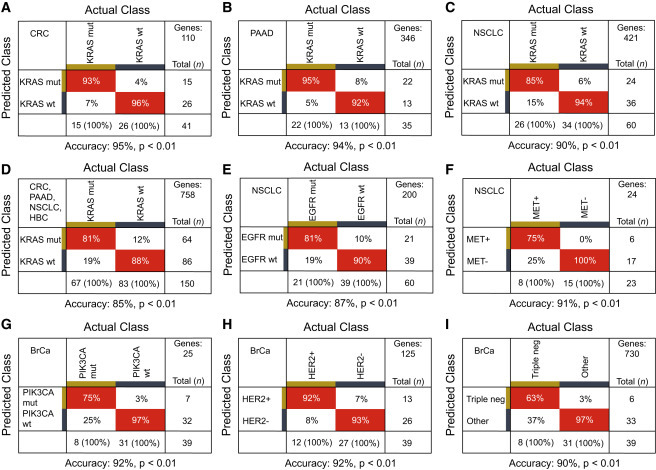 (D) Confusion matrix of multiclass SVM/LOOCV diagnostics of the training cohort consisting of healthy donors (healthy) and patients with GBM, NSCLC, PAAD, CRC, BrCa, and HBC. Indicated are detection rates as compared to the actual classes in percentages. (E) Confusion matrix of multiclass SVM algorithm in a validation cohort (n = 108). Indicated are sample numbers and detection rates in percentages. Genes, number of mRNAs included in training of the SVM algorithm. See also Figure S2 and Tables S4, S5, and S6. Blood provides a promising biosource for the detection of companion diagnostics biomarkers for therapy selection (Bettegowda et al., 2014, Crowley et al., 2013,Papadopoulos et al., 2006). We selected platelet samples of patients with distinct therapy-guiding markers confirmed in matching tumor tissue. Although the platelet mRNA profiles contained undetectable or low levels of these mutant biomarkers, the TEP mRNA profiles did allow to distinguish patients with KRASmutant tumors from KRAS wild-type tumors in PAAD, CRC, NSCLC, and HBC patients, and EGFR mutant tumors in NSCLC patients, using algorithms specifically trained on biomarker-specific input gene lists (all p < 0.01 versus random classifiers, Figures 3A–3E ; Table S4). 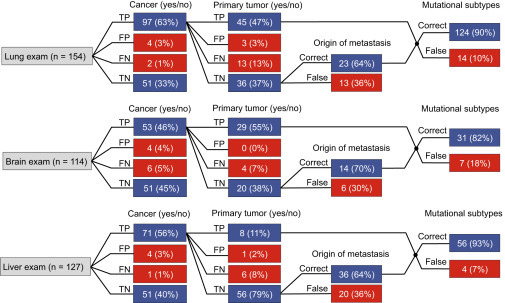 Even though the number of samples analyzed is relatively low and the risk of algorithm overfitting needs to be taken into account, the TEP profiles distinguished patients with HER2-amplified, PIK3CA mutant or triple-negative BrCa, and NSCLC patients with MET overexpression (all p < 0.01 versus random classifiers, Figures 3F–3I). We subsequently compared the diagnostic accuracy of the TEP mRNA classification method with a targeted KRAS (exon 12 and 13) and EGFR (exon 20 and 21) amplicon deep sequencing strategy (∼5,000× coverage) on the Illumina Miseq platform using prospectively collected blood samples of patients with localized or metastasized cancer. This method did allow for the detection of individual mutant KRAS and EGFR sequences in both plasma DNA and platelet RNA (Table S7), indicating sequestration and potential education capacity of mutant, tumor-derived RNA biomarkers in TEPs. Mutant KRAS was detected in 62% and 39%, respectively, of plasma DNA (n = 103, kappa statistics = 0.370, p < 0.05) and platelet RNA (n = 144, kappa statistics = 0.213, p < 0.05) of patients with a KRAS mutation in primary tumor tissue. The sensitivity of the plasma DNA tests was relatively poor as reported by others (Bettegowda et al., 2014, Thierry et al., 2014), which may partly be attributed to the loss of plasma DNA quality due to relatively long blood sample storage (EDTA blood samples were stored up to 48 hr at room temperature before plasma isolation). To discriminate KRAS mutant from wild-type tumors in blood, the TEP mRNA profiles provided superior concordance with tissue molecular status (kappa statistics = 0.795–0.895, p < 0.05) compared to KRAS amplicon sequencing analysis of both plasma DNA and platelet RNA (Table S7). Thus, TEP mRNA profiles can harness potential blood-based surrogate onco-signatures for tumor tissue biomarkers that enable cancer patient stratification and therapy selection. Cross tables of SVM/LOOCV diagnostics with the molecular markers KRAS in (A) CRC, (B) PAAD, and (C) NSCLC patients, (D) KRAS in the combined cohort of patients with either CRC, PAAD, NSCLC, or HBC, (E) EGFR and (F) MET in NSCLC patients, (G) PIK3CA mutations, (H) HER2-amplification, and (I) triple negative status in BrCa patients. Genes, number of mRNAs included in training of the SVM algorithm. See alsoTables S4 and S7. Unequivocal discrimination of primary versus metastatic nature of a tumor may be difficult and hamper adequate therapy selection. Since the TEP profiles closely resemble the different tumor types as determined by their organ of origin—regardless of systemic dissemination—this potentially allows for organ-specific cancer diagnostics. Hence we selected all healthy donors and all patients with primary or metastatic tumor burden in the lung (n = 154), brain (n = 114), or liver (n = 127). We performed “organ exams” and instructed the SVM/LOOCV algorithm to determine for lung, brain, and liver the presence or absence of cancer (96%, 91%, and 96% accuracy, respectively), with cancer subclassified as primary or metastatic tumor (84%, 93%, and 90% accuracy, respectively) and in case of metastases to identify the potential organ of origin (64%, 70%, and 64% accuracy, respectively). The platelet mRNA profiles enabled assignment of the cancer to the different organs with high accuracy (Figure 4). In addition, using the same TEP mRNA profiles we were able to again indicate the biomarker status of the tumor tissues (90%, 82%, and 93% accuracy, respectively) (Figure 4). SVM/LOOCV diagnostics of healthy donors (n = 55) and patients with primary or metastatic tumor burden in the lung (n = 99; totaling 154 tests), brain (n = 62; totaling 114 tests), or liver (n = 72; totaling 127 tests), to determine the presence or absence of cancer, with cancer subclassified as primary or metastatic tumor, in case of metastases the identified organ of origin, and the correctly identified molecular markers. Of note, at the exam level of mutational subtypes some samples were included in multiple classifiers (i.e., KRAS, EGFR, PIK3CA,HER2-amplification, MET-overexpression, or triple negative status), explaining the higher number in mutational tests than the total number of included samples. TP, true positive; FP, false positive; FN, false negative; TN, true negative. Indicated are sample numbers and detection rates in percentages. The use of blood-based liquid biopsies to detect, diagnose, and monitor cancer may enable earlier diagnosis of cancer, lower costs by tailoring molecular targeted treatments, improve convenience for cancer patients, and ultimately supplements clinical oncological decision-making. Current blood-based biosources under evaluation demonstrate suboptimal sensitivity for cancer diagnostics, in particular in patients with localized disease. So far, none of the current blood-based biosources, including plasma DNA, exosomes, and CTCs, have been employed for multiclass cancer diagnostics (Alix-Panabières and Pantel, 2014, Bettegowda et al., 2014, Skog et al., 2008), hampering its implementation for early cancer detection. Here, we report that molecular interrogation of blood platelet mRNA can offer valuable diagnostics information for all cancer patients analyzed—spanning six different tumor types. Our results suggest that platelets may be employable as an all-in-one biosource to broadly scan for molecular traces of cancer in general and provide a strong indication on tumor type and molecular subclass. This includes patients with localized disease possibly allowing for targeted diagnostic confirmation using routine clinical diagnostics for each particular tumor type. Since the discovery of circulating tumor material in blood of patients with cancer (Leon et al., 1977) and the recognition of the clinical utility of blood-based liquid biopsies, a wealth of studies has assessed the use of blood for cancer diagnostics, prognostication and treatment monitoring (Alix-Panabières et al., 2012, Bidard et al., 2014, Crowley et al., 2013, Haber and Velculescu, 2014). By development of highly sensitive targeted detection methods, such as targeted deep sequencing (Newman et al., 2014), droplet digital PCR (Bettegowda et al., 2014), and allele-specific PCR (Maheswaran et al., 2008, Thierry et al., 2014), the utility and applicability of liquid biopsies for clinical implementation has accelerated. These advances previously allowed for a pan-cancer comparison of various biosources and revealed that in >75% of cancers, including advanced stage pancreas, colorectal, breast, and ovarian cancer, cell-free DNA is detectable although detection rates are dependent on the grade of the tumor and depth of analysis (Bettegowda et al., 2014). 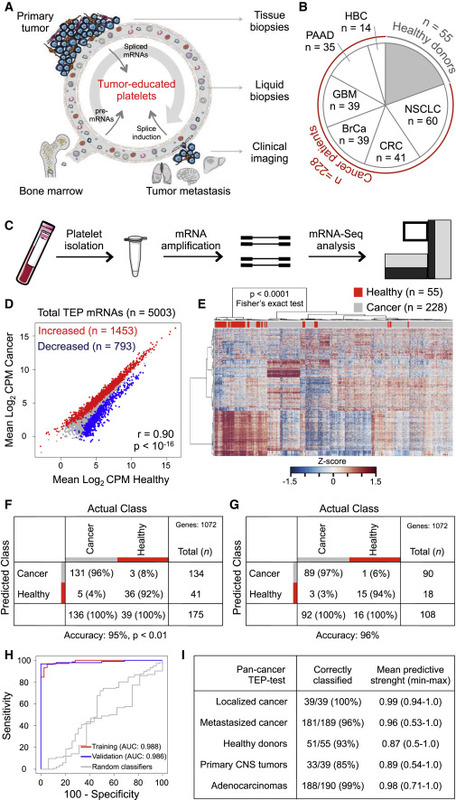 Here, we show that the platelet RNA profiles are affected in nearly all cancer patients, regardless of the type of tumor, although the abundance of tumor-associated RNAs seems variable among cancer patients. In addition, surrogate RNA onco-signatures of tissue biomarkers, also in 88% of localized KRAS mutant cancer patients as measured by the tumor-specific and pan-cancer SVM/LOOCV procedures, are readily available from a minute amount (100–500 pg) of platelet RNA. As whole blood can be stored up to 48 hr on room temperature prior to isolation of the platelet pellet, while maintaining high-quality RNA and the dominant cancer RNA signatures, TEPs can be more readily implemented in daily clinical laboratory practice and could potentially be shipped prior to further blood sample processing. Blood platelets are widely involved in tumor growth and cancer progression (Gay and Felding-Habermann, 2011). Platelets sequester solubilized tumor-associated proteins (Klement et al., 2009) and spliced and unspliced mRNAs (Calverley et al., 2010, Nilsson et al., 2011), whereas platelets do also directly interact with tumor cells (Labelle et al., 2011), neutrophils (Sreeramkumar et al., 2014), circulating NK-cells (Palumbo et al., 2005, Placke et al., 2012), and circulating tumor cells (Ting et al., 2014, Yu et al., 2013). Interestingly, in vivo experiments have revealed breast cancer-mediated systemic instigation by supplying circulating platelets with pro-inflammatory and pro-angiogenic proteins, supporting outgrowth of dormant metastatic foci (Kuznetsov et al., 2012). Using a gene ontology methodology, CAGE, we correlated TEP-cancer signatures with publicly available curated datasets. Indeed, we identified widespread correlations with cancer tissues, hypoxia, platelet-signatures, and cytoskeleton, possibly reflecting the “alert” and pro-tumorigenic state of TEPs. We observed strong negative correlations with RNAs implicated in RNA translation, T cell immunity, and interleukin-signaling, implying diminished needs of TEPs for RNAs involved in these biological processes or orchestrated translation of these RNAs to proteins (Denis et al., 2005). We observed that the tumor-specific educational programs in TEPs are predominantly influenced by tumor type and, to a lesser extent, by tumor progression and metastases. Although we were not able to measure significant differences between non-metastasized and metastasized tumors, we do not exclude that the use of larger sample sets could allow for the generation of SVM algorithms that do have the power to discriminate between certain stages of cancer, including those with in situ carcinomas and even pre-malignant lesions. In addition, different molecular tumor subtypes (e.g., HER2-amplified versus wild-type BrCa) result in different effects on the platelet profiles, possibly caused by different “educational” stimuli generated by the different molecular tumor subtypes (Koboldt et al., 2012). Altogether, the RNA content of platelets in patients with cancer is dependent on the transcriptional state of the bone-marrow megakaryocyte (Calverley et al., 2010, McAllister and Weinberg, 2014), complemented by sequestration of spliced RNA (Nilsson et al., 2011), release of RNA (Clancy and Freedman, 2014, Kirschbaum et al., 2015, Rak and Guha, 2012, Risitano et al., 2012), and possibly queue-specific pre-mRNA splicing during platelet circulation. Partial or complete normalization of the platelet profiles following successful treatment of the tumor would enable TEP-based disease recurrence monitoring, requiring the analysis of follow-up platelet samples. Future studies will be required to address the tumor-specific “educated” profiles on both an (small non-coding) RNA (Laffont et al., 2013, Landry et al., 2009, Leidinger et al., 2014, Lu et al., 2005) and protein (Burkhart et al., 2014,Geiger et al., 2013, Klement et al., 2009) level and determine the ability of gene ontology, blood-based cancer classification. In conclusion, we provide robust evidence for the clinical relevance of blood platelets for liquid biopsy-based molecular diagnostics in patients with several types of cancer. Further validation is warranted to determine the potential of surrogate TEP profiles for blood-based companion diagnostics, therapy selection, longitudinal monitoring, and disease recurrence monitoring. In addition, we expect the self-learning algorithms to further improve by including significantly more samples. For this approach, isolation of the platelet fraction from whole blood should be performed within 48 hr after blood withdrawal, the platelet fraction can subsequently be frozen for cancer diagnosis. Also, future studies should address causes and anticipated risks of outlier samples identified in this study, such as healthy donors classified as cancer patients. Systemic factors such as chronic or transient inflammatory diseases, or cardiovascular events and other non-cancerous diseases may also influence the platelet mRNA profile and require evaluation in follow-up studies, possibly also including individuals predisposed for cancer. Akbani, R., Ng, P.K.S., Werner, H.M.J., Shahmoradgoli, M., Zhang, F., Ju, Z., Liu, W., Yang, J.-Y., Yoshihara, K., Li, J. et al. A pan-cancer proteomic perspective on The Cancer Genome Atlas. Alix-Panabières, C. and Pantel, K. Challenges in circulating tumour cell research. Alix-Panabières, C., Schwarzenbach, H., and Pantel, K. Circulating tumor cells and circulating tumor DNA. Bettegowda, C., Sausen, M., Leary, R.J., Kinde, I., Wang, Y., Agrawal, N., Bartlett, B.R., Wang, H., Luber, B., Alani, R.M. et al. Detection of circulating tumor DNA in early- and late-stage human malignancies. Bidard, F.-C., Peeters, D.J., Fehm, T., Nolé, F., Gisbert-Criado, R., Mavroudis, D., Grisanti, S., Generali, D., Garcia-Saenz, J.A., Stebbing, J. et al. Clinical validity of circulating tumour cells in patients with metastatic breast cancer: a pooled analysis of individual patient data. Bray, P.F., McKenzie, S.E., Edelstein, L.C., Nagalla, S., Delgrosso, K., Ertel, A., Kupper, J., Jing, Y., Londin, E., Loher, P. et al. The complex transcriptional landscape of the anucleate human platelet. Burkhart, J.M., Gambaryan, S., Watson, S.P., Jurk, K., Walter, U., Sickmann, A., Heemskerk, J.W.M., and Zahedi, R.P. What can proteomics tell us about platelets?. Calverley, D.C., Phang, T.L., Choudhury, Q.G., Gao, B., Oton, A.B., Weyant, M.J., and Geraci, M.W. Significant downregulation of platelet gene expression in metastatic lung cancer. Chan, K.C.A., Jiang, P., Chan, C.W.M., Sun, K., Wong, J., Hui, E.P., Chan, S.L., Chan, W.C., Hui, D.S.C., Ng, S.S.M. et al. Noninvasive detection of cancer-associated genome-wide hypomethylation and copy number aberrations by plasma DNA bisulfite sequencing.